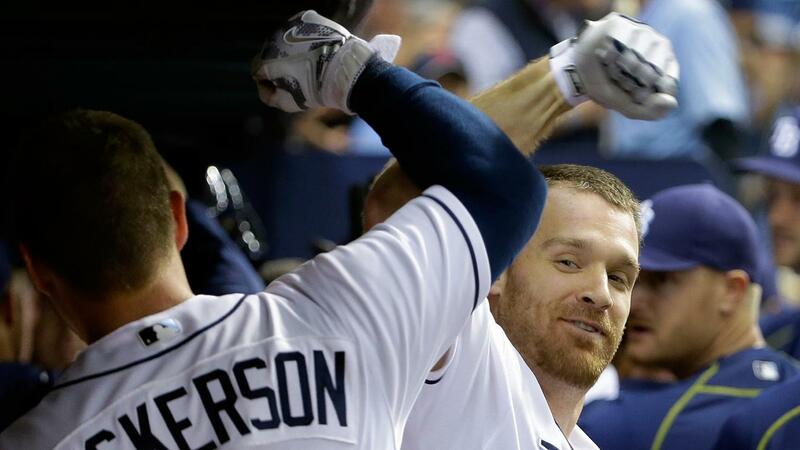 Logan Forsythe and Evan Longoria hit two-run homers in the bottom of the eighth to lead the Rays to a 5-1 win over the Indians on Tuesday night at Tropicana Field. "That was a big one," Rays manager Kevin Cash said. "We've played in plenty of close games already in the early part of the season. So the guys are quickly becoming seasoned to it, to where there shouldn't be much effect, but they keep grinding it out against a really good pitcher." Indians starter Corey Kluber had pitched well through 7 2/3 innings when Forsythe jumped on a 3-2 offering, depositing the ball over the wall in left for his second home run of the season. Forsythe's blast chased Kluber. Cody Allen entered the game and walked Logan Morrison before Longoria connected on a 3-2 pitch and launched it into the left-field stands for his second home run of the season and a 5-1 Rays lead. Francisco Lindor broke a scoreless tie in the fourth with a solo homer to center off Rays starter Matt Moore. The Rays got on the scoreboard in the seventh when Jose Ramirezmisjudged Corey Dickerson's opposite-field drive with two outs. Dickerson ended up with a double then scored when Desmond Jennings singled to center to tie the game at 1. Outfield defense: Lindor opened the Indians' fourth with a homer and Mike Napoli followed with a single. Carlos Santana then hit a ball to left that sounded like it might clear the wall. Instead, Jennings caught the ball and snapped off a quick throw to second in time to nail Napoli trying to advance from first. The unique double play saved at least one run as the next batter, Yan Gomes, doubled. Despite posting three hits in the inning, the Indians scored just once. Winless rotation: Moore pitched well for the Rays, allowing one run on five hits in seven innings, but he came away with a no-decision. Ironically, the Rays' biggest asset -- its starting pitching -- has come up empty this season. After Moore's performance Tuesday night, Rays starters are 0-4, with a 4.91 ERA so far in 2016. Kluber falters late: After stifling the Rays for most of the night, Kluber allowed one run in the seventh off an RBI single by Jennings. Then Forsythe's two-run home run proved to be the difference. It was a sudden pivot for Kluber, who struck out six and had a one-hitter going in the seventh. "I made a bad pitch at the biggest point in the game," Kluber said. Lindor's leadoff homer: Not usually known for his power, Francisco Lindor launched a solo home run to center field to start the fourth inning for his first long ball of the season. Lindor had just 12 home runs in 390 at-bats last year. Entering Tuesday, he was 5-for-10 against left-handed pitching this season. The Rays' streak of consecutive games with a home run appeared in jeopardy Tuesday night until Forsythe came through, extending the club record to 21 games. Francona challenged an out call on the field after Napoli tagged up at first and tried to advance to second on a flyout to left in the fourth. The call on the field was upheld following a one-minute, one-second delay. A crew chief review took place with one out in the bottom of the eighth after Kevin Kiermaierwas called safe on a steal of second. After a one-minute, 18-second delay, the ruling came back and the call on the field was confirmed. Indians: Right-hander Carlos Carrasco returns Wednesday night to Tropicana Field, where he threw a near no-hitter on July 1, 2015. He allowed one hit in 8 2/3 innings with 13 strikeouts and two walks in the win. He's a career 2-3 with a 2.78 ERA and 34 strikeouts in six appearances (five starts) against Tampa Bay. Rays: After warming up to pitch against the Orioles on Saturday night, the game was postponed, pushing Drew Smyly's second start back to Wednesday. The left-hander allowed three home runs to Toronto in his first start on April 4. He is 2-1 with a 4.25 ERA in 13 career appearances against the Indians.